Councillors in Lancashire have rejected a proposal to twin Preston with the Palestinian town of Nablus. Supporters of the proposal wanted to used it to highlight the experience of Nablus residents, where entry to the town is currently controlled by the Israeli army. However, on Thursday councillors rejected said while they acknowledged residents' plight, it was "inappropriate" to use twinning as a means of publicising their cause. The proposal sparked opposition from the Zionist Central Council, which said Preston should not be twinned with a town "known for its terrorist activity". The motion was proposed by Socialist Alliance councillor Michael Lavalette, who said it was Preston's way of "extending the hand of solidarity" to Nablus. 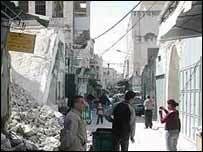 "The people of Nablus suffer daily from the Israeli occupation," he said. "Twinning is our way of...telling the Palestinian people that they and their struggle are not forgotten." It was also backed by Mark Hendrick, Preston's Labour MP, as well as veteran politician Tony Benn. "A friendship between the peoples of Britain and Palestine is absolutely essential to maintain their morale and help them to realise that they are not alone in their struggle for justice," added Mr Benn.